We have our new Candyman, just don't say his name five times in the mirror. It was revealed back in November that the iconic horror franchise is getting a new entry courtesy of producer Jordan Peele, the man behind the Oscar-winning blockbuster smash hit Get Out. The project has been coming together bit by bit ever since the announcement and now arguably the biggest piece of the puzzle has been put into place, as Yahya Abdul-Mateen II has been tapped to play the titular character in the upcoming movie. 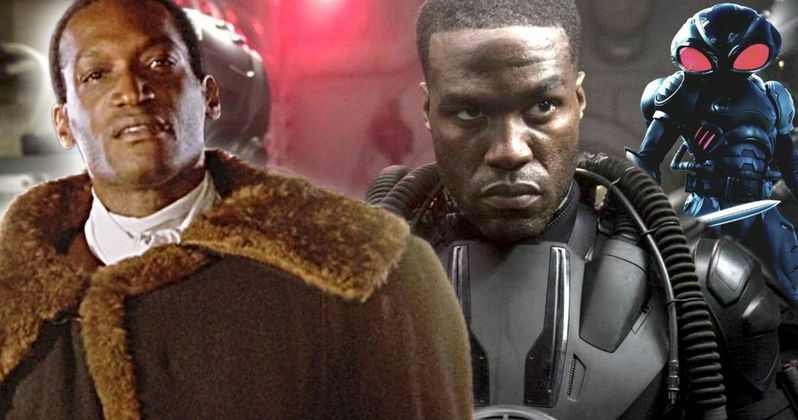 According to a new report, Yahya Abdul-Mateen II is in talks with MGM to play the lead in Candyman, which has been described as a "spiritual sequel" to the original 1992 horror classic. However, it's stressed that no deal has been made yet. Abdul-Mateen II was seen most recently as Black Manta in Warner Bros.' Aquaman alongside Jason Momoa. The James Wan-directed DC Comics adaptation went on to gross more than $1.2 billion at the global box office, which has helped to boost the actor's profile a great deal. That, no doubt, helped him to score the role, but it's not a coincidence that he's also starring in Jordan Peele's upcoming thriller Us, which arrives next month. Aside from that, Yahya Abdul-Mateen II is also set to appear in HBO's upcoming Watchmen TV series. Some of his other credits include Netflix's The Get Down and The Greatest Showman. This is a double-edged sword, in terms of casting. On the one hand, he seems like a great choice for the role, especially considering that he will be starring (assuming the deal closes) alongside Lakeith Stanfield (Sorry to Bother You) who has been cast as the other lead. But there has been a great deal of hope that Tony Todd, who originated the role, would be given the chance to return. Todd has expressed his desire to come back for the movie several times. This doesn't necessarily mean that Tony Todd can't come back, but he won't be around in the same capacity he was previously. It's unlikely that Jordan Peele, who co-wrote the screenplay, would relegate Todd to a throwaway cameo. Peele has expressed his reverence for the original Candyman in the past. Nia DaCosta (Little Woods) is in the director's chair. So, even though Peele has a lot of power, a lot of what happens is up to her. While many plot details are being kept under wraps, this sequel will see a man in Chicago who begins to research the urban legend known as Candyman. The journey leads him to a now-gentrified part of the city and, inevitably, once he starts snooping, people start to die. Production on the sequel is expected to begin in the spring. Candyman is currently set to hit theaters on June 12, 2020. We'll be sure to keep you posted as any further details on the project come to light. This news was first reported by Variety.